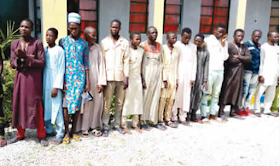 The Sokoto Police Command marched 16 suspected criminals for alleged involvement in criminal activities in the state. The suspects would have terrorized the state for some time before the long arm of the law catches them. Bilyaminu Yahaya, Jubril Zulkifi, Ahmed Sheu Adili and Masarana Hamza also marched for engaging in homosexual practice. Speaking to a police headquarters reporter in Sokoto on Thursday, police public relations officer Delf Cordeila Nwawe revealed that others had been arrested for criminal conspiracy, theft, possession of stolen goods, possession dried leaves suspected of being Indian hemp. to other criminal activities. "The current police commissioner has come to the state to do a job, nobody will stay on his way. "Our dream is to keep the peace in Sokoto and we will never let the activities of local boys, thugs and thieves or any kind of criminal activity take us back," she said.